Dr. Narendra Prabhu has done his Orthopaedic residency from the reputed Kasturba Medical College,Mangalore, India. He is a Member of the Royal College of Surgeons, Glasgow, UK and AO Trauma International. He has done his fellowship on Spine at Queens Medical Centre, Nottingham, UK. Dr. Prabhu has 19 years of experience in Trauma, HiP and Knee Replacement, Knee Arthroscopy ( ACL Reconstruction) and Lumbar Spine surgeries. He has performed and supervised more than 5000 trauma cases and hundreds of joint replacements, Lumbar Spine surgeries and ACL Reconstructions. He is well trained in all types of complex trauma surgeries including Minimally invasive techniques. 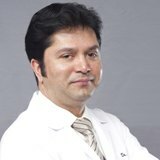 Dr. Prabhu has published and also presented many papers at National and International levels.As a teacher, he has taught and trained many post graduate students in Orthopaedics, while working as Associate professor of Orthopaedics at Kasturba Medical College Mangalore India.